Samsung today launched the successor to its original Galaxy Tab tablet, one year after first showing off the 7-inch Galaxy Tab at last year’s IFA trade show in Berlin. That Samsung would refresh that initial model, and bring its naming convention more in line with the other tablets in the company’s lineup (the Galaxy Tab 10.1 and Galaxy Tab 8.9) was predictable. That Samsung would include a Super AMOLED Plus display on such a large screen was less of a given, but no less welcome. A year ago, some observers had theorized that Samsung might include an AMOLED display on its first Galaxy Tab. 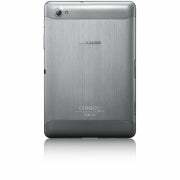 But the company didn't show off its 7-inch Super AMOLED Plus display technology until November 2010. The panels—actually 7.7 inches—went into mass production in August 2011, so the use of Super AMOLED Plus makes total sense for the next-generation 7-inch-class Tab. The display brings the benefits of Super AMOLED Plus (bright display, vibrant colors) together with a sharp resolution—1280 by 800 pixels. That makes it the highest-resolution display on a tablet we’ve seen. So far. The Tab’s introduction today, as with the Samsung Note, was a worldwide unveiling. As of now, according to Samsung, there are no plans for it to come to the U.S. market. That said, fall CTIA isn’t far away—and I fully expect we will have news coming from Samsung about Tab 7.7’s U.S. availability just in time for the final holiday shopping crunch. The Tab 7.7 packs a 1.4GHz dual-core processor (no word on the type of CPU) and Android 3.2v Honeycomb (not clear what the “v” stands for on the spec sheet, though this does include Samsung’s TouchWiz UX interface). 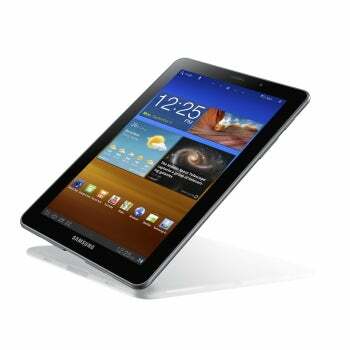 Like Samsung’s other Galaxy Tab introductions this year, the 7.7 distinguishes itself with its slim and sleek design. 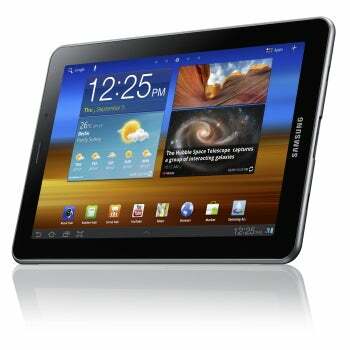 The Tab 7.7 measures 7.89 millimeters thin, or 0.31 inch, practically two-tenths of an inch less than the original Galaxy Tab’s depth. The new model is lighter, too: It weighs only 335 grams (0.75 pound), which shaves a full tenth of a pound off the weight of last year’s model, and makes this tablet one of the lightest on the market. That weight also helps to make this device the first tablet to seriously begin to close the gap between tablets and dedicated e-readers with E Ink displays. Granted, e-readers now hover around the half-pound mark, but the Tab 7.7’s progress in shedding weight is noteworthy, nonetheless. Another less touted, but notable inclusion: Universal Remote Control functionality, so you can control your home entertainment system components directly from the tablet. (Presumably this capability uses a built-in IR blaster, but that wasn’t stated on the available spec information.) After trying out a URC on the new Sony Tablet S, I’m convinced this will be one of the must-have features for a tablet going forward. Samsung says the Tab 7.7’s 5100 mAh battery will provide up to 10 hours of video playback. The unit will come in 16GB, 32GB, and 64GB capacities, with a microSD card slot on board for up to 32GB of files. The cautious language of Samsung’s press release indicates a dangerous trend forming, though. The company specifies the microSD card slot is for “direct media files transfer” only, something that Sony did with its Tablet S as well. I don’t like this trend one bit: Consumers are used to card slots supplementing their storage, not being used solely as a transfer mechanism. Clearly, with this announcement, as well as the recent release of the Acer Iconia A100 and others, the 7-inch-tablet market has a new lease on life. Now all we need is Samsung’s release timing and pricing, which I expect we’ll hear more about by October.